In honor of Election Day in the United States and in roundabout follow-up to Edgar Allan Poe’s century-late funeral, check out the above recent podcast from Nate DiMeo of The Memory Palace. 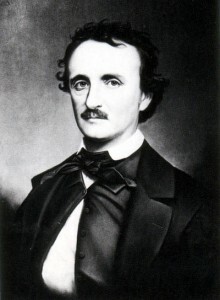 Nate describes the circumstances surrounding Poe’s mysterious death, who was found in the street outside a Baltimore tavern, delirious and dressed in another man’s clothes. Taken to the hospital, he floundered in and out of consciousness; unable to articulate what had happened, he died a few days later. One theory, as Nate relays, is Poe was randomly kidnapped and coerced into a vicious form of voter fraud known as “cooping”: in between quick clothes changes, threats, beatings and drugs, he was carted by thugs around the city to different polling stations and forced to vote. Posted by Meg Holle in Death + Crime and tagged celebrity death, mysterious deaths, podcast. Bookmark the permalink.